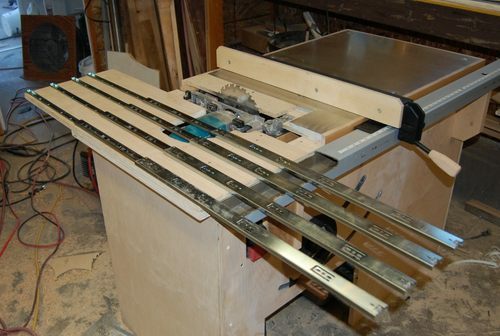 My reasons for building the saw are economy - a saw with these rip and crosscut capacities is not cheap and it has a relatively compact footprint: my shop has limited space. Oh, the challenge and I enjoy it (you understand). The motor assembly is from a Makita contractor saw that I modified to work here. 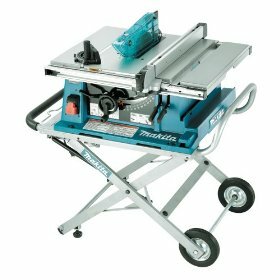 The motor assembly is the only part of the Makita saw that was any good - powerful, quiet, high RPM and an electric brake. Lining it up accurately was tricky, but the end result is very rigid and easy to access for adjustment (if needed). 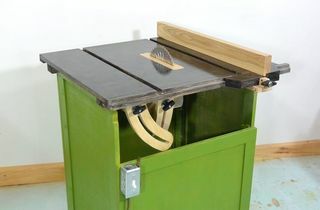 John's added an extended lever to more easily and precisely set the angle on the saw. The extension is made of welded tubular steel. 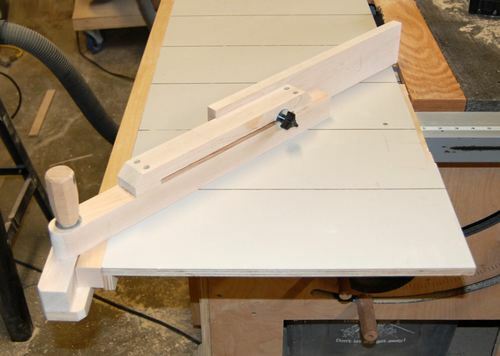 The angle setting is fast and easy - I opted for this style to simplify it and to make quick angle settings (without endlessly cranking a hand wheel). Increasing the radius gives me more precision on the scale as well. It needed to be rock solid, the steel welded on looks a bit overboard but it is all needed. 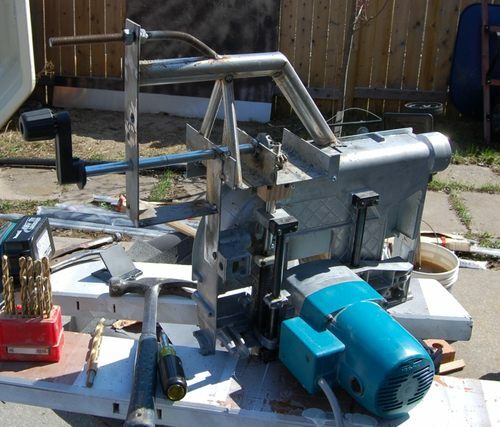 That rinky dink little plastic crank was from the original saw. Moving the depth adjustment crank downwards necessitated further modifications. 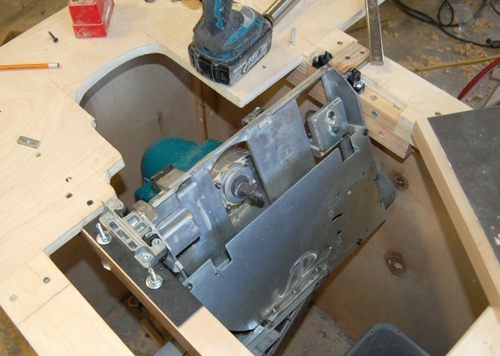 "The bevel gears are part of the motor lift and I had to extend the vertical shaft by 6" - one of the main problems with the old saw was that when set to 45° the up-down crank was nearly touching the fence rail, making it next to impossible to turn. 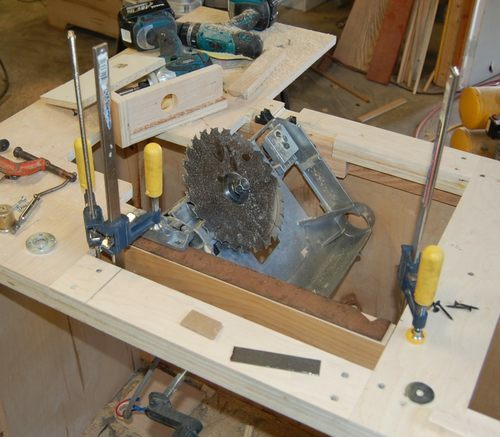 By extending the shaft, I effectively moved the crank axle down, away from the fence rail." Originally, the shaft and adjustment crank were mounted at 'A', coupled with a depth adjustment screw with bevel gears at 'B'. After modifying, an extension couples where the bevel gears used to be, and the bevel gears are moved to 'C'. The depth of cut at 90* with a 10" blade is 3 1/8"
I only lose ~1/4" in maximum depth of cut to the original contractor saw as the mounting point is higher than the bottom of the top. In the pics, that is an 8 1/4" blade (Freud makes a really good 24 tooth ripping blade - $24.00 at Rona) that I normally use. A 7 1/4" will still rip a 2 x 4 no problem but I have several 10" blades in any case. 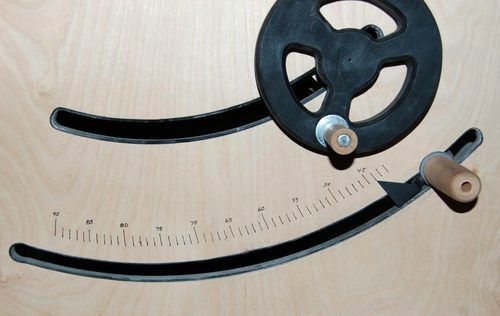 I made the new 7" hand wheel from Baltic birch ply (2 layers of 1/2") and the handle is sapele - much nicer. 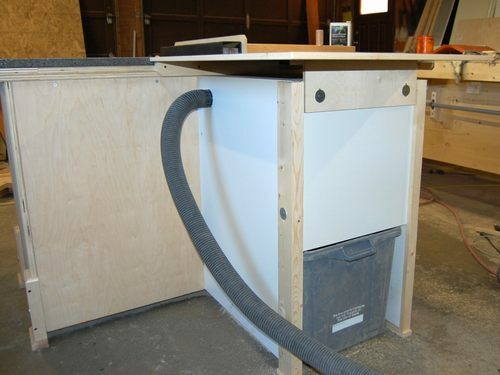 The bin catches nearly everything (it's one of the best ideas I've ever had) and the 2.5 inch hose connects to my dust collector to pull the fine dust that gets airborne during a lot of cutting - it makes a huge difference. The hose is just connected to that enclosure and captures the fine dust. It doesn't go through to the exhaust. 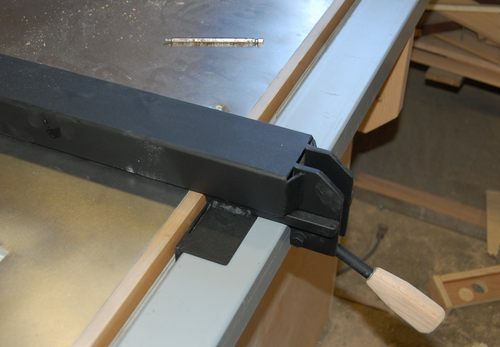 Most of the time this hose is not connected - it's only when I'm doing a lot of cutting or cutting something obnoxious like mahogany (I hate the taste of that) or MDF. 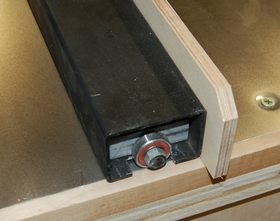 The table rides on four 28" full extension drawer slides (see attached pic). It has very smooth action and no lateral play. Also seen in the pic, the original top was 2 layers of 1/2" particle board with a stainless steel surface but it was not flat enough (hence the new concrete top). 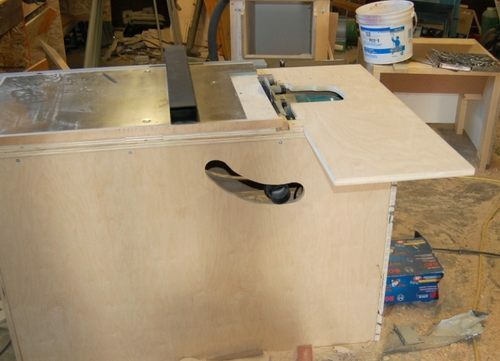 My main objective for the sliding table was to minimize lateral play to give an accurate cut and to make the whole assembly easy to disassemble for cleaning and lubrication. 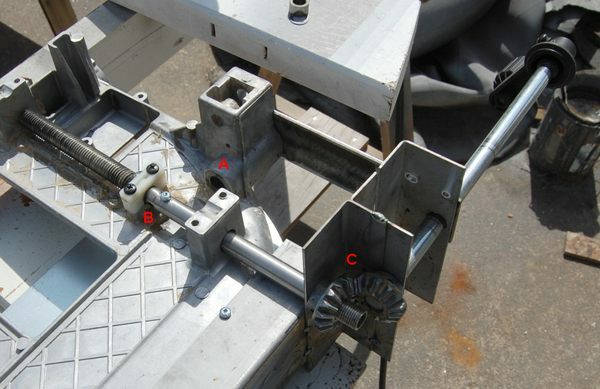 With the slides flat and with the other support mechanisms in place (aluminum stiffening rails between the slides) , there is very little (negligible?) vertical play at the blade, where the maximum support is. The largest panel I would crosscut is ~24" and most times a lot less than that. It works much better than I expected and using 4 of the slides really helps to eliminate play. 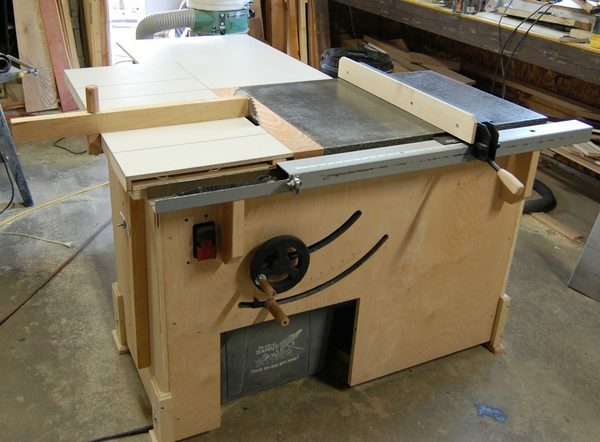 To cast the concrete top flat I stacked some sheets of 3/4" birch plywood on my assembly table and topped that with a piece of 5/8" melamine. I spent some time checking this form for flatness. I cut strips of plywood to 1" to form the edge. 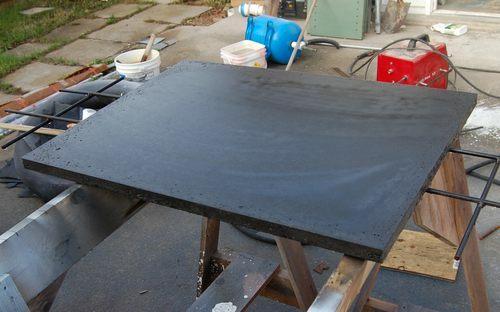 The concrete is a fiber reinforced bag mix, 30mPa with some non-shrink grout added and black pigment - my el-cheapo granite top: $10.00. It is extremely flat and of very consistent thickness. I need to let it cure for another week or so before I fill it and seal it. It is exactly 24" x 32" x 1" and used one 30kg bag of concrete mix. The fence has strips of "slippery tape" on the front angle part and with the bearing in the end, it glides across smoothly and effortlessly. The bearing at the end is the only part of the fence that touches the top. I finally got around to building the proper crosscut fence for my sliding table. 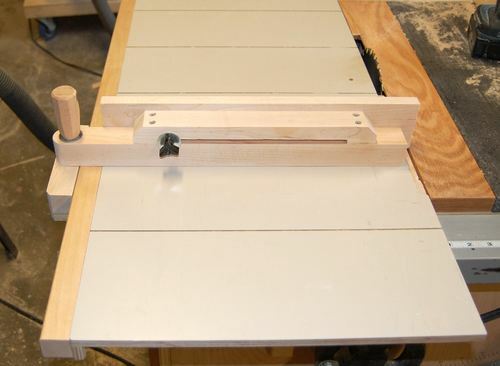 It is surprisingly solid and quick to adjust and remove - it uses one of 2 pivot pin locations on the table for maximum 90 degree crosscut of 24" and max 45 degree cut at 11". I feel this is more than adequate for my needs.